Our apartment is certified by the Region Liguria, this is a certification that guarantees you a perfect stay ! The villa was built on the grounds of a historic property called 'Alfano Park' which belonged to the famous orchestra conductor Franco Alfano who is credited with having completed Puccini's unfinished 'Turandot' opera. The apartment is only minutes away from the town's center but the main attraction of this location is the low traffic flow and the lush, green Mediterrenean gardens which surround the site. Ancient palms, mimosas and pepper trees decorate the area as well as roses and cicas bordering the lawn. Outdoor dining under the covered portico of the main entrance is enjoyed throughout the year - the property is completely sheltered from local winds. Sanremo is known for it's micro climate which offers maximum outside leisure throughout winter months. One of the most recent major attractions is the 24 km ( 15 miles ) bicycle and walking path between Ospedaletti and San Lorenzo al Mare. An enjoyable way to keep fit and take in the beauty of the coastline. Rent-a-bike stations are found along the tract. less than an hour away. Hi, I am Evy ,the owner, but is my husband Gianni, who worked in a hotel for 40 years and know well the guest's needs, the manager of my apartment. We are sure to offer you a wonderful and unforgettable Holiday, our apartment is certified by the Region of Liguria. This is a certification that guarantees you a perfect stay. Ask always before booking. Included in the price four Bikes are available for use. Household linen hiring and final cleaning are not included in the price. Apartment/ flat 4 - 5 persons. 3 room(s) , of which 2 Bedroom(s), Independent kitchen, Living room, Dining room, 1 bathroom, 2 separate toilets, Loggia - Surface area : 85 m2 / 914 sqft, Garden : 250 sqm / 2690 sqft. Year of construction : 1975, Date of last renovation : 2003. Amenities Bedding : 1 Double bed, 1 Bunk bed(s) (2 places), 1 portable bed(s). Laundry machine, Deep Freezer, TV, Private parking lot, Cooking: stove, Oven, Refrigerator: Fridge freezer, Kettle, Shower, Bathtub, Bidet, Jacuzzi, Shoe and boot lockers, Outdoor furniture, Deckchairs, Iron, Ironing board, Heating, Cable TV / Satellite TV, TV socket. Additional supplementary services - Household linen for hire, Cleaning service available, Wake-up alarm, Airport transport upon demand. Thanks so much for your review, I hope to meet you again in Sanremo. Appartement spacieux, très joliment décoré avec beaucoup de charme et d'élégance correspondant au quartier. Accueil très sympathique par le propriétaire qui nous a donné beaucoup de conseils et de bonnes adresses. Quartier très plaisant et agréable situé très proche des plages de sable, supermarché et magasins. L'alloggio è spazioso, pulito, arioso e dotato di ogni confort, televisione a grande schermo con canali satellitari in tutte le lingue, connessione wifi senza problemi. Il giardino è curato nei minimi particolari, la posizione in una strada chiusa ne favorisce il silenzio e la tranquillità. Raggiungere le spiagge ed il centro, per chi ama camminare, non è un problema, in pochi minuti si arriva al litorale. I padroni di casa sono sempre disponibili, all'arrivo ci hanno invitato ad un tour in città con loro per farci conoscere ristoranti, spiagge, grandi magazzini e quant'altro è utile conoscere all'arrivo in una città per la prima volta. Di Sanremo che dire : " Sanremo è sempre Sanremo". Ho soggioornato in questo piccolo angolo di Paradiso durante la settimana festivaliera ed è stata una piacevole esperienza. Situata non lontano dal centro, raggiungibile facilmente a piedi o con i mezzi pubblici, in un quartiere signorile la villa è immersa in in giardino curato ed è particolarmente silenziosa. L'alloggio., situato al piano giardino dispone di tutti i confort moderni compresi internet e la tv satellitare. Ben esposta e riparata dai venti . I proprietari sono molto cortesi e disponibili. Sicuramente tornerò. La ringrazio per la sua recensione, soddisfare appieno i nostri ospiti è per noi fonte di orgoglio. La aspettiamo a Sanremo per brindadre assieme alla sua prossima vacanza. Great property for our family and we were extremely well looked after by Gianni, picking us up and dropping off at the station and offering lifts if required, a massive help when travelling by train with children. 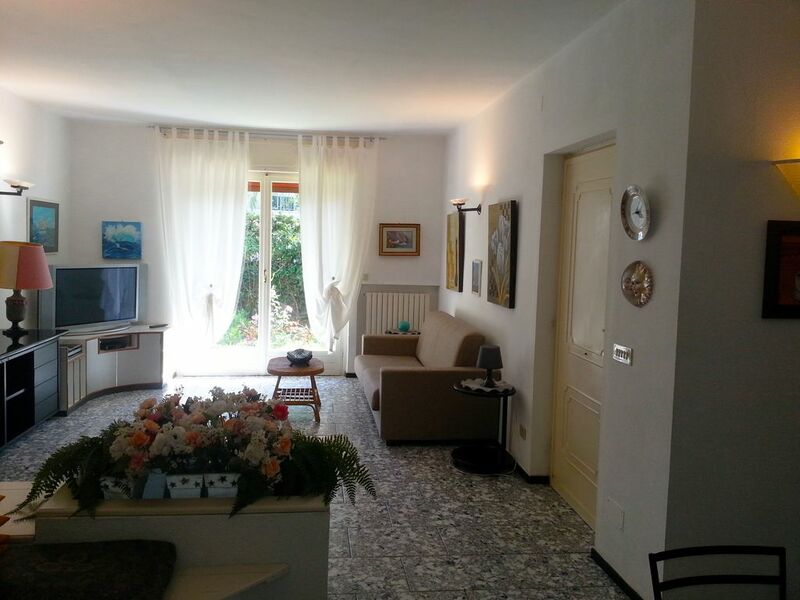 Sanremo beautiful place and apartment is well placed for beach and town if you enjoy walking. We were offered use of bikes also and had lovely cycle ride by the coast which was a nice bonus. The villa was built on the grounds of a historic property called 'Alfano Park' which belonged to the famous orchestra conductor Franco Alfano who is credited with having completed Puccini's unfinished 'Turandot' opera. The apartment is only minutes away from the town's center but the main attraction of this location is the low traffic flow and the lush, green Mediterrenean gardens which surround the site. Ancient palms, mimosas and pepper trees decorate the area as well as roses and cicas bordering the lawn. Outdoor dining under the covered portico of the main entrance is enjoyed throughout the year - the property is completely sheltered from local winds. Sanremo is known for it's micro climate which offers maximum outside leisure throughout winter months. of the numerous English owned houses that are still found there. keep fit and take in the beauty of the coastline. Rent-a-bike stations are found along the tract. In the price are not included gas electricity,household linen and final cleaning. Three Bikes free of charge are available for use.